Reworking camera position is one of the most frustrating aspects of the install job. Not only is it inefficent and frustrating for both the customer and integrator, the issue can easily be prevented with a little forethought. In this note, we discuss the value in identifying and documenting camera views before starting an install. 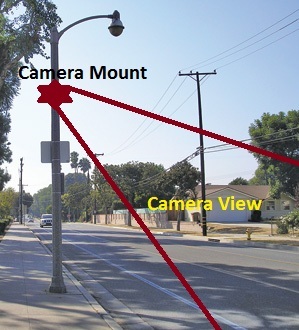 Before installing, agreement should be reached where cameras are mounted, aimed and what they will view. When installation jobs are estimated, time is typically not included to position and focus cameras more than once. Since repositioning often requires the full scope of refocusing the camera and reconfiguring motion detection, this effort is time consuming and can significantly impact profits. Confirming camera location and intended views with the customer before installation will ensure that repositioning work is kept to a minimum. The best solution is to effectively document, up front, where cameras should be and what they should see. A comprehensive walk though of all camera locations with the customer is key. The customer should describe in detail what they wish to 'see' and the integrator should take notes and pictures to document those directions. The integrator may physically 'mark' the region of interest with tape marks, up to taking a picture with a camera and to represent the exact scene being sought. This information can also influence lens and focal length selection as well as camera specification. Such images minimize confusion or finger pointing because all parties can see and agree up front the specific location of the camera. If the integrator chooses to create a physical document from this information, it can be adapted to include other important details about the install such as camera IP addresses, MAC addresses, I/O integrations, view names, stream settings, and a handful of other configuration details. This document becomes 'a system install guide' that becomes very valuable for installation technicians. Wasting effort on an installation job due to miscommunication is a common circumstance. Making sure that intended camera views are documented and agreed upon before beginning work can prevent headache.